One pregnancy. Four friends. 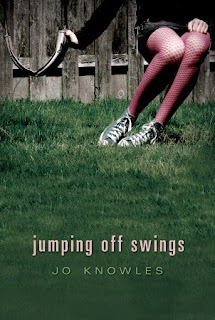 It all adds up to a profound time of change in this poignant, sensitively written YA novel. while anyway. So when Josh, an eager virgin with a troubled home life, leads her from a party to the backseat of his van, Ellie follows. But their "one-time thing" is far from perfect: Ellie gets pregnant. Josh reacts with shame and heartbreak, while their confidantes, Caleb and Corinne, deal with their own complex swirl of emotions. No matter what Ellie chooses, all four teenagers will be forced to grow up a little faster as a result. Told alternately from each character’s point of view, this deeply insightful novel explores the aftershocks of the biggest decision of one fragile girl’s life — and the realities of leaving innocence behind. The blurb for Jumping Off Swings oversells the book, in my opinion. I expected so much more than what I got. To say it was disappointing is a bit of an understatement. There were multiple things I didn't like about this book. The characters weren't interesting. We never really get to know our characters or why they behave the way they do. I didn't connect or feel anything towards any of them. The fact that the book is so short combined with four (yes, FOUR) different points of view probably aid in the lack of character development. I feel like four POVs in such a short book spreads everything too thin, especially for the topics touched on in the books. Speaking of topics in the book, everything felt very glossed over. There were no deep, real moments. I was definitely let down. Overall, a short read that wasn't really worth the time. I don't think I can recommend Jumping Off Swings to anyone.